Wisconsin was explored by the French from bases in Canada. Jean Nicollet visited eastern Wisconsin in 1534. A fuller expedition was conducted by traders Radisson and Groseilliers (1658-1659) Father Allouez established a mission near the present Green Bay in 1665. The first permanent settlement was made near the same area in 1670. The entire state was a part of New France until the French were defeated in 1763. The sympathies of the settlers were primarily to the British, and retained their allegiance during the Revolutionary War. 1763 - Wisconsin was part of the territory ceded by France to Great Britain in the Treaty of Paris. On this date Britain passed the Quebec Act, making Wisconsin part of the province of Quebec. Enacted by George III, the act restored the French form of civil law to the region. The Thirteen Colonies considered the Quebec Act as one of the "Intolerable Acts," as it nullified Western claims of the coast colonies by extending the boundaries of the province of Quebec to the Ohio River on the south and to the Mississippi River on the west. 1780/September 6 - the Congress of the United States asked the several states having claims to waste and unappropriated lands in the western country to make a cession to the United States for the benefit of the Union. In a deed signed on March 1, 1784 and modified on December 30, 1788, The State of Virginia yielded to the United States her claim to the area northwest of the Ohio River with the stipulation that it be formed into distinct states. For the purpose of temporary government The Northwest Territory came into being in 1787. Five states were carved from this territory: Ohio, Indiana, Illinois, Michigan and Wisconsin. 1783 - Acquired by treaty from Great Britain: Lands North of River Ohio, bordered on the West by the Mississippi River, with a Northern boundary starting at Lake of the Woods in the Northwest (Northeast Minnesota) continuing East through the center points of Lakes Superior, Huron, Erie and Ontario. 1787 - Under the Northwest Ordinance, "Northwest Territory" organized from areas of Wisconsin, Michigan, Illinois, Indiana, majority of Ohio, and Northeast Minnesota. 1800 - Indiana Territory organized from Northwest Territory, taking Wisconsin, Illinois, Indiana, Northeast Minnesota and West half of Michigan. "New" Northwest Territory made up of Ohio and East half of Michigan. 1805/January 11 - It became a part of Michigan Territory. Note: The Northwest Territory, after 1816, was basically under the control and influence of the American Fur Company, owned by American millionaire John Jacob Aster, and a couple of Canadian firms. The company put one to two fur traders in charge, each with his own independent, but sometimes over-lapping area. This action was legitimized by the U.S. government, but hardly publicized in history. The company controlled almost all aspects of living within the Territory. 1818 - Wisconsin was again transferred back to Michigan Territory after Illinois became a state on April 18, 1818, and remained a part of Michigan Territory until 1836. The area in Wisconsin was called Brown County On October 26th (16th ? ), 1818 Brown County was formed by the Governor of the Territory of Michigan - Lewis Cass, who named it after General Jacob Brown ( commanding general of the US Army from 1815-1828), the county seat being in Green Bay. 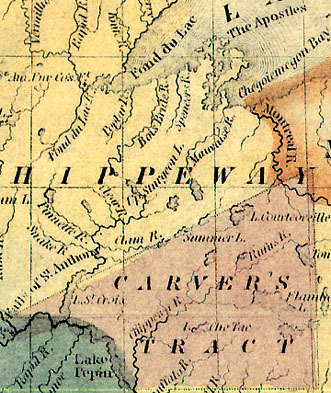 While still a part of Michigan Territory, names applied to the future Wisconsin area included "Ouisconsin Territory" and a revival of the name "Northwest Territory". 1818 - Treaty with Great Britain sets Northern border at 49 degrees North, adding Northwest Minn. to the Missouri Territory. 1819 - A census of the Indians taken in 1819 showed that there were 4800 in the Green Bay Agency. Governor Cass visiting the western posts arrived at Green Bay to find over sixty dwellings and five hundred inhabitants. The fort (Fort Howard) consisted of log barracks facing three sides of a square parade ground, surrounded by a stockade of timber thirty feet high, whitewashed, and garrisoned by three hundred men, under Captain William Whistler. Also stationed three miles above Fort Howard were three hundred infantry. The boundaries of Brown County at this time stretched over the entire eastern shore of Wisconsin, to the east to lake Michigan, to the south as far as the Illinois line, and as far west as the Wisconsin River and Fort Winnebago. 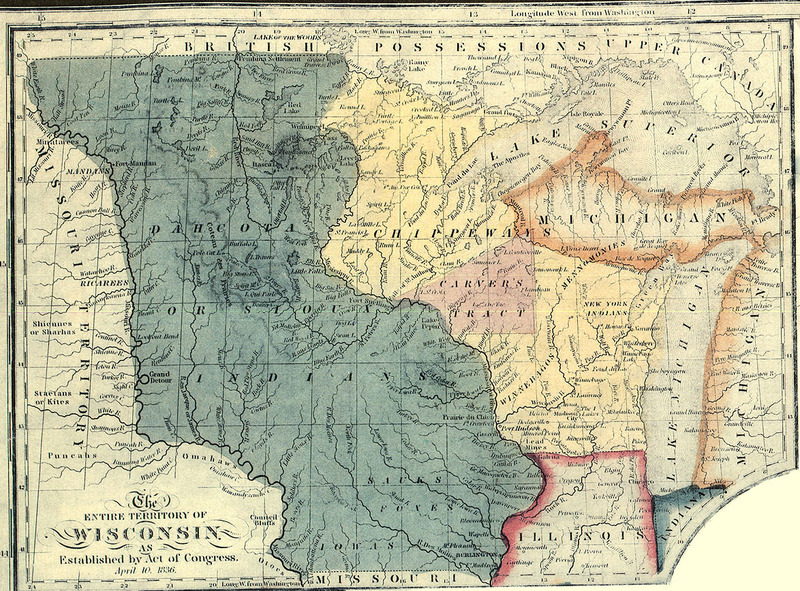 1820 - Missouri Compromise forbids slavery in what was to become the Wisconsin Territory. The first white settler, in what was to be later called the Town of Brookfield, William Howe, arrived in 1820 with a Presidential Land Grant giving him title to the area. As described by the historian, William Raney, the region that is now Wisconsin, although a part of the United States since 1783 and of the Michigan Territory since 1818, belonged to another nation: "Apart from small bits of land used as the sites of Forts Howard and Crawford, and what had been occupied by French Canadian settlers long before and secured to them by European treaties, Wisconsin was in 1827 still legally the property of the Indians." The United States government dealt only with those Indian tribes near enough to the settlements to cause trouble or impede the advance of the white frontier. During the generation between the War of 1812 and the Mexican War, Wisconsin was in the zone of contact between the two races. The federal government exercised control partly military and partly civil. An irregular line of garrisoned forts, established at various times, swept across Wisconsin and Iowa to the Missouri River and back across Arkansas and Louisiana. Along this frontier of some fifteen hundred miles a part of the regular army maintained peace and respect for the United States. Fort Howard at Green Bay and Fort Crawford at Prairie du Chien were established in 1816, and Fort Winnebago was added at Portage in 1828. Each of these forts usually had between one and two hundred soldiers. Boundaries between tribal lands were not well defined. Tribes traditionally crossed and hunted each other’s areas, occasionally leading to conflicts. A conference was held in 1825 at Prairie du Chien, hosted by Lewis Cass and William Clark, precisely to quell disputes among the tribes and to set limits to their lands. "The southeastern and southwestern corners of present Wisconsin with adjacent parts of Illinois were assigned to certain Chippewa, Ottawa and Potawatomi. The rest of southern Wisconsin was recognized as belonging to the Winnebago, whose irregularly shaped holdings touched the Mississippi north of Prairie du Chien and stretched northeast to Lake Winnebago and north to the Black River." 1830 CENSUS INDEX lists the area as the Michigan Territory, Iowa County (now Wisconsin). After the Black Hawk War, two treaties were signed. In September, 1832, the Winnebago signed away the remainder of their lands south of the Fox and Wisconsin. A year later, the Chippewa, Ottawa, and Potawatomi relinquished the rest of southern Wisconsin east of the Rock River and adjoining Illinois. With the conclusion of those two treaties, all of Wisconsin south of the Fox and Wisconsin belonged to the United States. Wasting little time, contracts were let immediately by the federal government to survey the lands that had been ceded by the Indians, and by the end of 1833 a significant part of the survey of southeastern Wisconsin had been completed. By an Act of Congress approved on June 26, 1834, two new land districts were created. East of a line from the northern boundary of Illinois to the Wisconsin River between ranges 8 and 9 was the Green Bay Land district; west of it was the Wisconsin Land district. Most of southeastern Wisconsin thus became available to settlers and land speculators. For the land in the Green Bay district, notice went out that all surveyed lands were for sale by the government of the United States, the sale to take place in 1835. 1834 - 1836 Spring - Topographic Bureau surveying crews set section corners and quarter section corners in the public lands in preparation for the first public land sale. The Michigan Territorial Legislature approved the creation of Milwaukee Territorial County on 6 September 1834. Milwaukee County was one of the four original counties in what later became the state of Wisconsin. Milwaukee, Green Bay and Mineral Point (Also called Wisconsin) were considered "land districts". La Crosse is also mentioned as one as well. 1835 March - The Green Bay Indian Trail is surveyed from Illinois State Line to Fort Howard by the U.S. Army Corps of Topographical Engineers. Map 5 (JPEG, 165K): "The Entire Territory of Wisconsin. As Established by Act of Congress. April 10, 1836." This map is an inset in a larger map which shows the populated areas of Wisconsin and Iowa Territories in 1838 – available as a reprint from Wisconsin Trails Magazine. Click here for a larger version (JPEG, 578K) of Map 5. Carver's Tract is shown in better detail here (JPEG, 99K). Source: John L's Old Maps Part 1: c.1710-1854 A collection of images centering eventually (in Part 2) on Northwestern Wisconsin, particularly Sawyer and Washburn Counties. To Thomas S. Redford, probably, belongs the distinction of having been the first one to drive his stake in this town of Lisbon (Did the name "Lisbon" exist at this time? If it did, why was it named as such?). When he first came here, he accompanied the surveying party of Hudson, Vliet and Brink, who surveyed through the town early in 1836. In May of this year, he collated the claim which he now occupies, on Section 25. 1836/July 3 - Wisconsin Territory was erected by act of Congress approved April 20, 1836; but it was the fourth of July before the Territorial officers were sworn in, and the twenty-fifth of October before the meeting of the Territorial legislature (at Belmont, in what is now La Fayette county). 1836 - the Wisconsin Territory is formed and the Milwaukee County Territory within it (from Brown County). 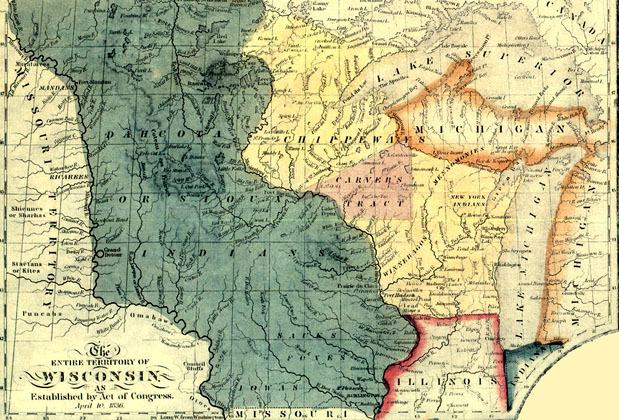 On 7 December 1836, the Wisconsin Territorial Legislature detached from Milwaukee County lands that became Dane, Dodge, Green, Jefferson, Portage, Walworth, and Washington Counties. 1838 - Iowa Territory created from Wisconsin Territory. Consists of the area "East of the Missouri River" (Central/East N. Dakota and S. Dakota, Iowa and Western half of Minnesota). Eastern Minn. remains part of Wisconsin Territory. 1839/December 20 - Milwaukee County was divided into townships - the original Town of Lisbon (which was 12 miles by 12 miles square) is split into the towns (each 6 miles by 6 miles square) of Lisbon, Menomonee, Pewaukee and Brookfield (Pewaukee actually split from Brookfield in 1840). This was approved by the Wisconsin Territory Legislature, but not effective until after March 1, 1840. Each of the other three original Towns (see 1838) divided themselves up in like manner, but all still part of Milwaukee County. See 1846. The Town of Warren (later called Merton) was created in 1839 by the original Town of Summit split. 1840's - The area is still rather wild, some Menomonee tribe of Indians, with a few Chippewa, remained in the marshy lake land known as the "Wild Marsh" which was located between Fussville and Lannon. 1840 - the Town of Menomonee (Township 8, Range 20, East) had a population of 59. 1843 - The Town of Warren (Merton) was divided, creating the Town of Nehmabin (later called the Town of Delafield),. at the First Town meeting held April 4, 1843 at the house of William Le Roy, on Section 26. 1844 - Sixteen towns now exist in what is to become Waukesha County. 1846/January 31 - the Towns of Lisbon, Menomonee, and Merton become part of the newly created Waukesha County when the 16 western most towns split from Milwaukee County (which prior to December 7, 1836 had extended all the way from Milwaukee to Madison) by Territorial Legislature vote. 1846, June 13 - By County Board vote, Prairieville (today's City of Waukesha) becomes the Waukesha County Seat and a County Courthouse building is soon constructed (but not until the first attempt is torn down due to insufficient foundation support). The two-story domed building is completed in 1849 and the County Board moves in. 1848/May 29 - Wisconsin became the 30th state admitted to the Union. The "Badger State" was the last state formed in its entirety from the Northwest Territory. 1848/1849/Winter of - The name of the Town of Warren changed to Merton to correspond with the name of the post office established in the town during the previous year. History of the Territory of Wisconsin From 1836–1848 — Moses M. Strong A. M. The author takes an in-depth look at the history of Wisconsin starting in the 1600s through 1848. From the first visit to Wisconsin by Nicollet in the 1600s through its induction into the United States of America, this book gives insight as to what life was like and the history behind what made the state of Wisconsin what it is today. The chapters include: Early Explorations of “Florida” and “Louisiana”, 1512-1719 (includes early Wisconsin explorers); Wars with Fox Indians, 1712 to 1746; The Langlade Family, 1745 to 1800; Jonathan Carvers Explorations, 1766 and 1767; Progress of Settlements in the Northwest and transfer to British Jurisdiction, 1705 to 1775; Under American Jurisdiction, 1787 to 1820; Green Bay, 1634 to 1836; Prairie Du Chien, 1680 to 1830; Chequamegon-Portage-Milwaukee; New York Indians, 1820 to 1839; The Lead Mines and Winnebago War, 1822 to 1828; The Black Hawk War, 1831 and 1832; Civil Government, 1512 to 1834; Legislation previous to 1835; Wisconsin in a Transition State, 1835 to 1836; Organization of Wisconsin Territory; Territory of Wisconsin, 1836, 1837, 1838, 1839, 1840, 1841, 1842, 1843, 1844, 1845, 1846, 1847, 1848; and Milwaukee and Rock River Canal. A fullname index is included. (1885) reprint, 655 pp., new fullname index. In Wisconsin, the local units of government are the counties, towns, villages, cities, school districts, and special districts. The 72 counties in Wisconsin are governed by a board of supervisors and have many "home rule" powers. The cities and villages are incorporated, and also have "home rule" powers. An isolated village must have at least 150 persons for incorporation. A metropolitan village must have 2,500 persons for incorporation. A village of more than 1,000 persons may become a fourth class city. Wisconsin has four classes of cities based on population, but only Milwaukee is a first class city (more than 150,000 persons). The form of government for cities and villages may be mayor-council, council-manager, or commission, although none of the latter are currently in use. Towns (known as townships in most of the United States) consist of all areas not in incorporated cities or villages. Further information can be found in Origin and Legislative History of County Boundaries in Wisconsin (Madison, Wisconsin: Wisconsin Historical Records Survey, 1942), and "Local Government in Wisconsin," State of Wisconsin Blue Book 1979-1980 (Madison, Wisconsin: Wisconsin Legislative Reference Bureau: 1979): 95-310.